Briton Jack Aitken kept a calm head to romp home to his debut win in the GP3 Series at Spa-Francorchamps in a race which saw three safety-car periods. 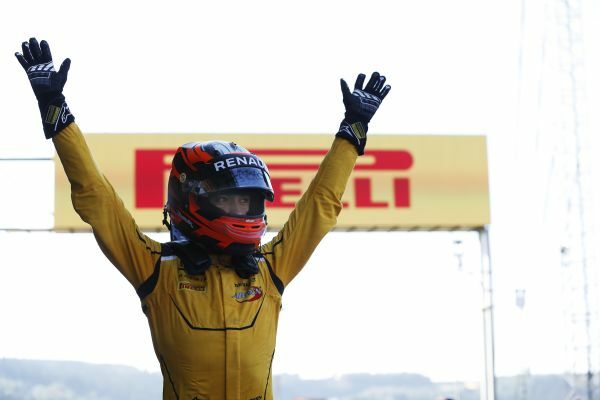 The Renault Academy driver started from third on the grid and moved into second passing DAMS’ Santino Ferrucci before Turn 1. The Arden driver then swiftly passed Koiranen GP’s Matevos Isaakyan to grab the lead of the race and remained in P1 until the chequered flag. Trident and Ferrari Driver Academy’s Antonio Fuoco was second ahead of Haas F1 development driver Ferrucci. Blue skies and warm temperatures greeted the paddock for the second race of Round 6 of the 2016 GP3 Series season with Isaakyan starting from reverse pole. The Russian made a strong start but it was Aitken from the second row who made an even better one, picking off Ferrucci to march into second. Aitken and the Arden team had shown strong race pace all weekend and he wasted no time in fighting for the lead, passing Isaakyan on lap 2. Ferrucci was keen to re-claim his second position but also had to fight off the advances of Campos Racing’s Steijn Schothorst and Fuoco early on. After posting the fastest lap of the race, Aitken began to edge away at the front; increasing his margin over the Koiranen GP driver to over 1s. The safety car was deployed on lap four after Konstantin Tereschenko spun and stopped. Once his Campos Racing car was cleared away, the racing resumed with Aitken maintaining his lead. Fuoco was looking racy as he passed Dutchman Schothorst for fourth but soon after the safety car was re-deployed after an incident between Matthew Parry and Jake Hughes which led to the duo both retiring after sustaining damage. At the end of lap 7, the race resumed with Series leader and Race 1 winner Charles Leclerc passing Schothorst for P4. Ferrucci was back into second after overtaking Isaakyan; the Russian then ran wide and lost a further place to Fuoco – allowing the Italian into third. Aitken’s lead was up to 2s at this point but there was a third safety car after Nirei Fukuzumi tagged Kevin Joerg and sent the Swiss driver into the barrier and into a premature retirement. The Japanese driver was issued with a 10s time penalty added to his race time. At the end of lap ten, the racing continued with Leclerc desperate to find a way past Isaakyan. Fuoco made the most of another re-start and passed American Ferrucci for P2. Despite the Monegasque’s best efforts, Isaakyan did a sterling job of defending and withstanding the pressure from the ART Grand Prix ace to retain fourth, with Leclerc then having to resist pressure from Jake Dennis. The Briton passed Leclerc before the end of the 13 lap race to claim P5, earning himself some hard-fought points. At the chequered flag, Aitken was delighted to record his first win in the category and the first win for Arden this season. Fuoco pocketed another podium to keep in contention for the title battle with Leclerc, whilst Ferrucci was all smiles, enjoying his maiden rostrum in GP3. Isaakyan, Dennis, Leclerc, Schothorst and De Vries completed the top eight. Scuderia Ferrari Team Development driver Leclerc now leads the Drivers’ Standings on 161 points, 22 points ahead of Fuoco who has reduced the gap to his fierce rival. Albon lies in third on 125 points. ART Grand Prix continue to lead the Teams’ Standings: the French squad have 402 points and have one hand on the team’s trophy. Trident and Koiranen GP are second and third. GP3 Series is back in action next week for Round 5 at Monza on September 02-04.